Remember when I said there were more than 2,400 closed-end funds, mutual funds and ETFs beating the S&P 500? Well, today we’re going to dive into three of those funds. Unlike many of their cousins, these aren’t one-hit wonders. All three boast outsized dividend payouts far larger than those of any S&P 500 stock: all the way up to 8.3%! So let’s dig deeper to see how these funds tick and what place they might have in your portfolio. If you want to invest in the latest cutting-edge technology, you usually have to give up income. 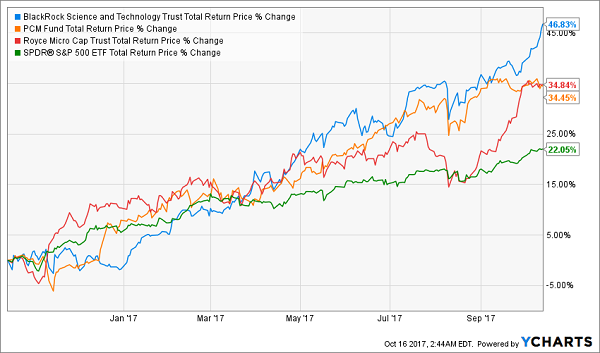 Most tech stocks pay no dividend at all, and the few that do, like Microsoft (MSFT) or Apple (AAPL), pay a paltry 2% at best. Granted, those dividends are growing, but we’ll be waiting a long time (if ever) for those stocks to match the 5.1% payout you get from BlackRock Science & Technology Trust (BST) today. BST is a special type of fund called a closed-end fund (if you’re unfamiliar with CEFs, click here to check out a primer I recently wrote on these ignored high yielders). And if you think it’s delivering that yield by purchasing a lot of risky assets, think again. Its top holdings are Alphabet (GOOG), Apple, Chinese mobile-media giant Tencent (TCEHY), Microsoft and Amazon (AMZN). BST also diversifies with other cash-printing machines like Visa (V) and MasterCard (MA), which are vacuuming up revenue around the world, thanks to growing mobile payments and credit-card use. Another nice thing about BST is that you’re getting these great stocks at a discount. Right now, the fund’s market price is about 5% shy of its holdings’ market value, so buying BST is like getting these stocks through a special sale that isn’t available on the open market. 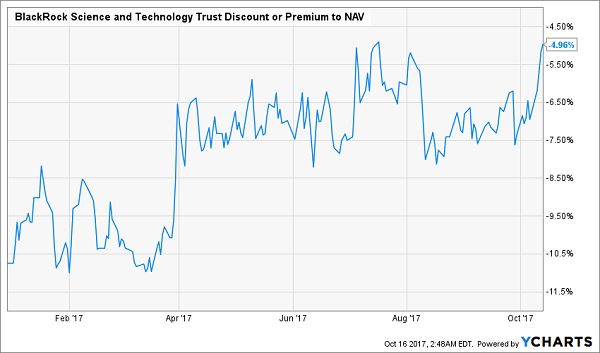 Discounted, top-notch tech stocks and an income stream adds up to a powerful (and rare) combo. It’s no wonder investors are snapping up BST shares. A lot of people stick to common stocks, but the funny thing is, they’re the riskiest assets in a company’s capital structure. Bonds, preferred stocks and senior loans offer more diversification and a much higher income stream. The only problem is that many of these assets aren’t easy for regular folks to buy on the open market. That’s where funds like the simply named PCM Fund (PCM) come in. 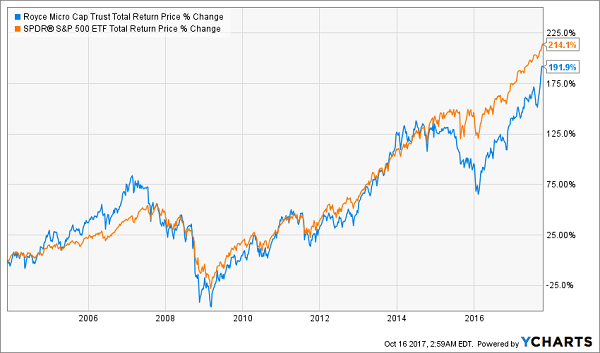 Over the past year, it’s up over 34%, while its annualized return over the last decade is just over 12%. Why the recent surge in performance? That’s right: PCM has been beating the market for two decades! Who wouldn’t be interested? Plus, the fund yields a whopping 8.3%, so this is an income gold mine on top of a market crusher. What about the fund’s assets? PCM is managed by one of the titans of the bond world: PIMCO. And right now, it’s focused on American asset-backed securities and mortgage-backed securities—bonds tied to a variety of loans to companies and individuals. Recently, management deftly shifted to shorter-term bonds, with over 70% of its portfolio in bonds maturing within five years. As bonds mature, PCM will have more cash to invest in new bonds. And remember that the Federal Reserve is planning to raise interest rates aggressively in 2018 and beyond. That means more income from the new bonds PCM will be in the market to buy, making its whopping income stream even safer than it is now. Investing in small companies takes a strong stomach and careful research, but Royce Funds has a long history of doing it well. During periods of economic uncertainty, Royce needs to act fast and avoid failing businesses. But in periods of strength, where inflation is rising, unemployment is declining and corporate earnings are growing, Royce can provide tremendous returns. Fortunately we’re now in a good economic environment. GDP growth is improving, US corporate earnings are rising and unemployment is dropping—even with recent disasters like hurricanes in the south and wildfires in California. Such a strong economic environment means it may be time to consider the Royce Micro Cap Trust (RMT), both to get exposure to fast-growing small firms and to grab the fund’s generous 6.9% dividend. 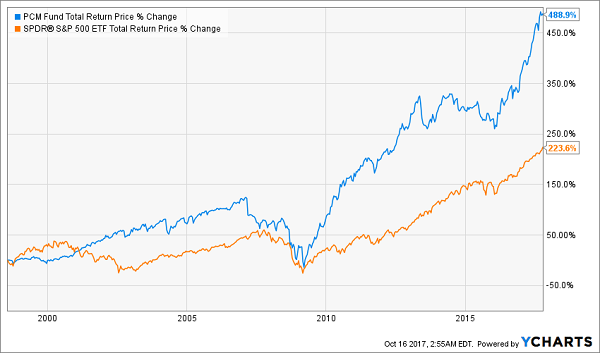 Plenty of other folks seem to think so, too, which is why RMT has soared 34.8% in the past year, while its 10-year annualized return is a more humble 6.9%. Be prepared to watch this one like a hawk, though—if the economy falters, as it inevitably will, don’t wait to head for the exits. But until then, we’re looking at some nice upside potential and a great income stream here. Plus, relentless dividend growth means your 7.9% yield will be more like 10% in short order.